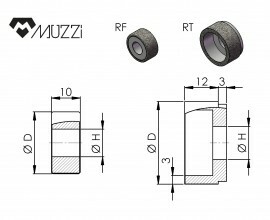 Muzzi realizes different sizes and dimensions of internal grinding wheels for marble and mechanical machinery. Standard grit sizes of our internal grinding wheels are D126 and B126: in case of order, please specify whether Diamond or CBN. Here you can know standard sizes normally in stock. Are you interested in our internal grinding wheels? Contact us now!